$15.00 Click the link to order a paperback copy of emoemoji : woods. Poetry paperback/digital edition, 188 pages, published by Edition Solitude, 2016. ISBN: 978-3-937158-92-1. 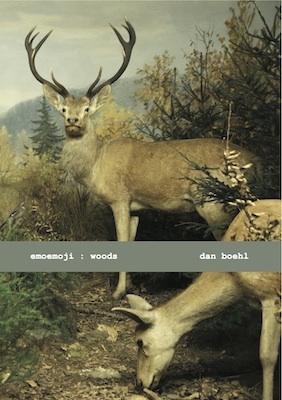 Click the link to download a free PDF copy of emoemoji : woods. Much like it’s predecessor, Kings of the F**king Sea, Dan Boehl’s second collection, emoemoji : woods, feels both ancient and contemporary, mythic and ephemeral.